Description: Round-shouldered orb weaver with elongate abdomen. However, large gravid females have almost circular abdomens. The dorsum of the abdomen varies in ground colour from yellow, greenish grey, orange, brownish red or red. Dorsum are distinctly marked with four large white spots forming a square in anterior half and a white median line on fore margin. Carapace light yellowish with dark median and lateral bands. The median band is irregular often wider or forked in front. Legs yellowish white, clearly annulated with dark brown and provided with strong spines. Male tibia II are provided with strong spines. Scape short and broad at base. Biology: This spider makes a Size: Female 9-15 mm; male 6-9 mm. 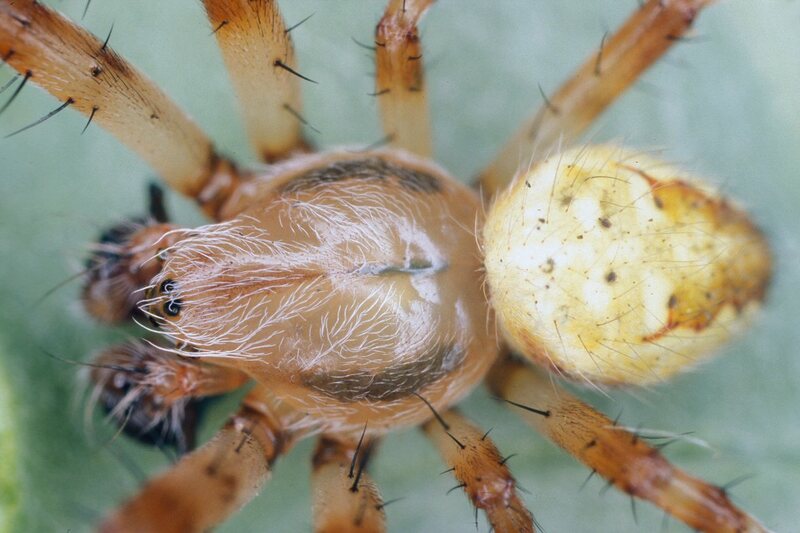 Genus: Araneus Clerck, 1757. (Angulate and round-shouldered orb weavers). 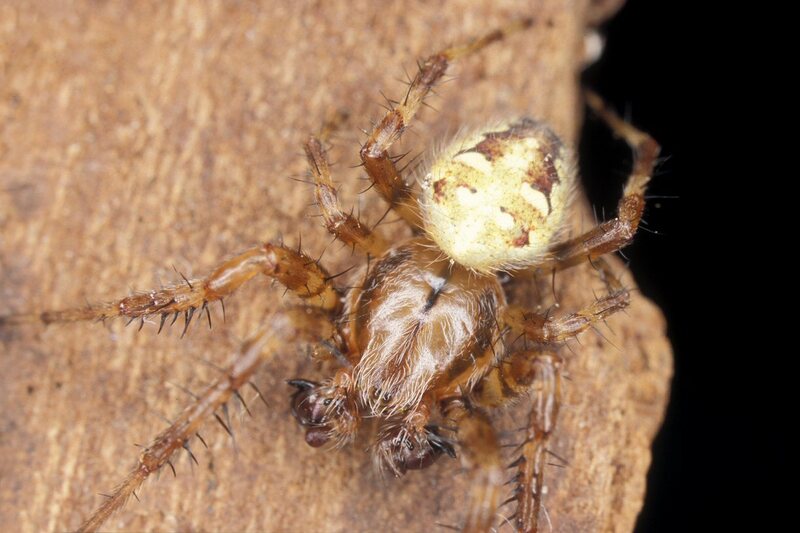 Characters of genus: Small to large large spiders ranging from 2.5 mm to at least 25 mm body length. Posterior medial eyes slightly larger than the rest and separated by one diameter from each other. Anterior medials separated by 2-3 diameters. Height of clypeus ca. 1.5 diameter of one anterior medial eye. 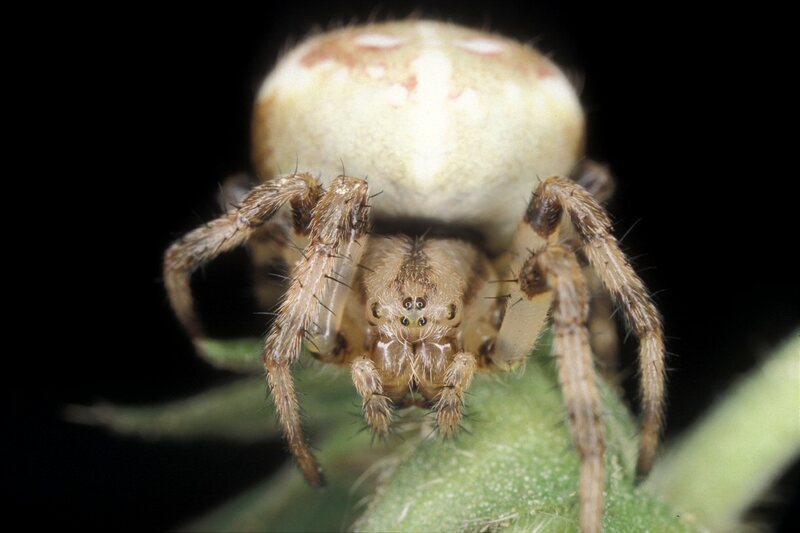 Some species have well-developed shoulder humps while other are round-shouldered or possess traces of humps such as Araneus diadematus. There is some sexual dimorphism with males smaller and much slimmer than females, especially gravid ones. Epigyne with large scape originating from base of epigyne. Male palp complex, the shape of embolus and terminal apophysis being the most important characters for separating the species (Almquist 2005). Family: Araneidae Simon, 1895 (Typical Orb Weavers). 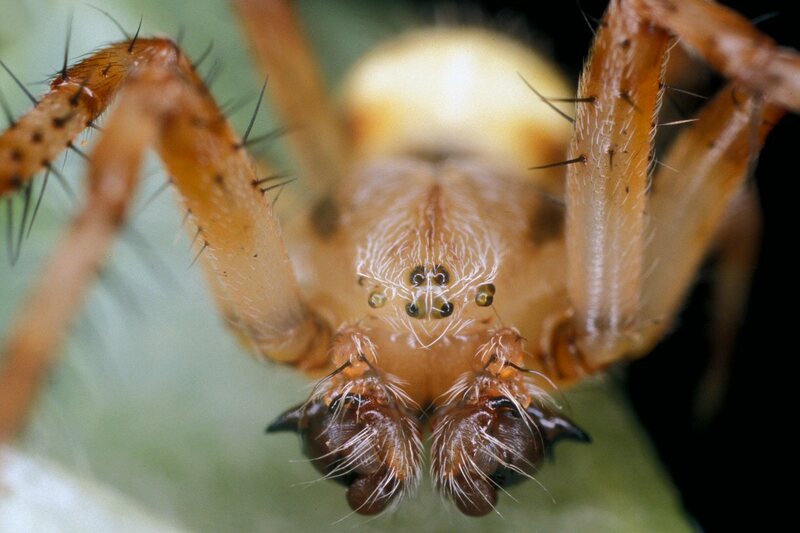 Characters of family: The araneids belong to the group of ecribellate spider families having 8 eyes and 3 tarsal claws. The eyes are arranged in 2 rows of 4 with the lateral eyes widely separated from the medial eyes. The carapace is often flat with a distinct head region. The chelicers are strong having a lateral condyle (boss at base of chelicer). Labium is wider than long and rebordered (swollen at anterior edge). Maxilla (basal part of palp used for chewing prey) are widest anteriorly. Legs with 3 claws and often furnished with strong spines and trichobothria on all segments except tarsi. Often legs are clearly annulated. 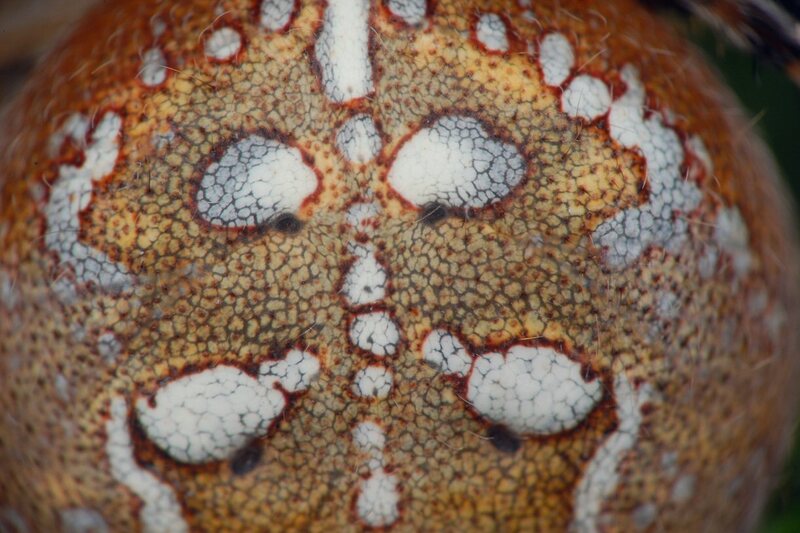 The abdomen is usually globose and nearly always with species-specific often bright colour patterns. The abdomens of some species are round-shouldered while others have humps, the latter species often referred to as angulate orb weavers. Some tropical species have large outgrows on the abdomen. A colulus (midline appendage or tubercle) is present in front of the anterior spinnerets. The tracheal spiracle is situated close to spinnerets. 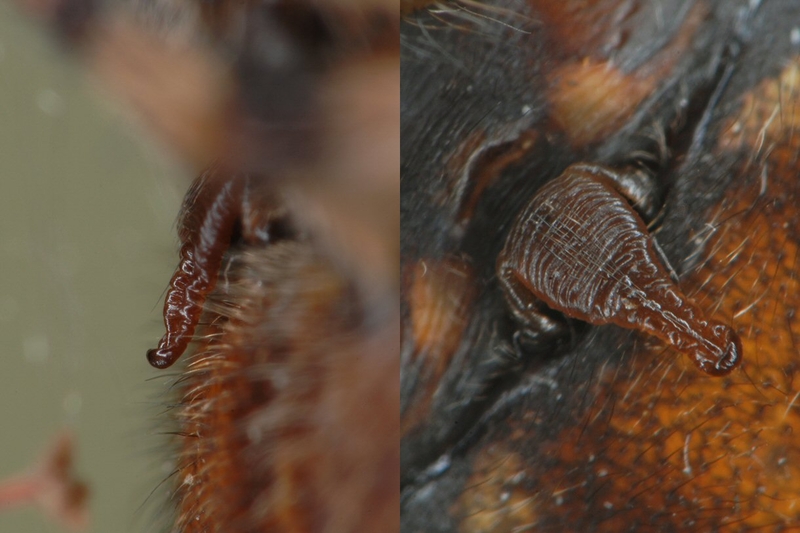 Araneids belong to the entelegyne group of spiders often having large and complex epigynes sometimes with a large flexible scapus (finger-, tongue-, or lip-like projection arising in the midline of the epigyne). The male palp is complex.